So, I used a sketch designed by Diana from Sketchy Thursdays that was created specifically for the Scrapbook Circle month long anniversary celebration. 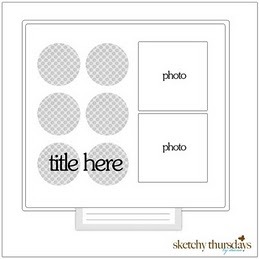 The Scrapbook Circle sketch reveal just happens to fall on the same day we are revealing the Sketchy Thursdays site reveal sooooo, I have two Sketchy Thursdays reveals for you today. This second one is going back to Christmas 2009. The papers in the Scrapbook Circle Anniversary kit just screamed at me to use these photos but I almost didn't because it seemed a bit too literal to me. Obviously I changed my mind. Please make sure to check out what the Sketchy Thursdays and the Scrapbook Circle gals did with these sketch and make sure to play along with us! Oh my goodness that first layout is absolutely adorable!! I love it! I am loving all the Sketchy Thursdays goodness here today!!! *wink* :) Great page with the "boobies on." Adorable! I have some pics of Nate with underwear on his head. Need to scrap 'em! Oh YES! The "Boobies On" story has finally made it to a page! It is hilaious!!! 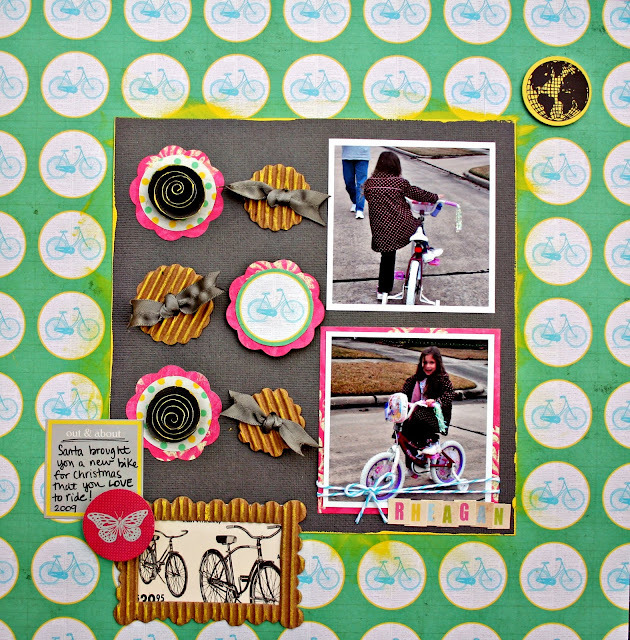 Fantastic reveals and I am so doing that Scrapbook Circle sketch! Love the "Boobies On" LO! hilarious and very well done! I saw it first on the scrapbook circle blog for the sketch! priceless! My daughter does the same thing with my bra but I never seem to have my camera near by. KIds say the craziest things hey? Love all her little poses! Great layouts. I love the title and the photos in the first layout, and I love the overall look and design in the second one. The scalloped circles with varying textures and ribbon....love it! :)! These layouts are GREAT!! love love, love, the bikes everywhere--photos and papers! oh, and the boobies page is too funny!